The reason I have been quiet lately is that I am off to the UK next week and will be back only after mid-July. There is so much work to be done before and during the trip. But I'll definitely post whenever I can and show you the Soap & Glory, Sleek, MUA, Collection, Dainty Doll and other goodies I buy. After the debacle that was the April 2015 LookFantastic beauty box - it featured vitamins for dieters and a mouthwash - I had very low expectations from the May edition. Dental floss, diuretic pills and a yoga mat, I had decided. Thankfully, the box I received contained none of those things and was far better than expected. For those who came in late, LookFantastic is a UK-based beauty box that ships worldwide. It costs £15 a month, but you save £45 with an annual subscription. 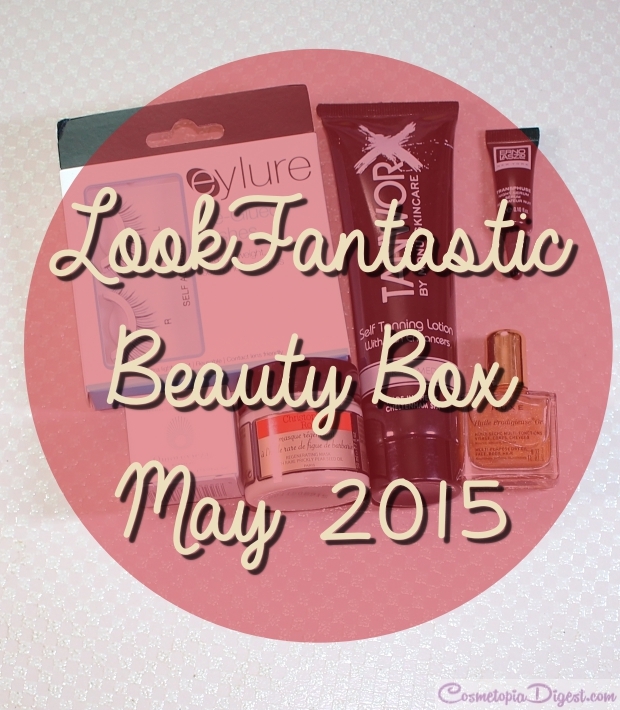 Check out my LookFantastic Beauty Box for May 2015. Enriched with rare prickly pear seed oil, this hair mask contains twice the amount of Vitamin E found in Argan Oil. In two minutes, it will make the hair shiny, smooth and healthy. It smells absolutely heavenly. Just looking at this mask makes my hair thirstier than Shane Warne. The mask is free from parabens, cones and SLS. I am going to take it with me on my trip next week, because air travel always dehydrates my hair (and skin) so it will be nice to give it some major TLC as soon as I land. At £50 a jar, I don't know if I will come back from the UK with a few of these in my suitcases - it all depends on whether the first use produces miracles. Doesn't this look exactly like a pot of gel eyeliner (See photo below this paragraph)? I hope I don't end up dipping an angled brush and applying it to my eyelid in a fit of absentmindedness. This Hungarian product contains sweet almond oil and Moor Mud, which is rich in magnesium and calcium. It smells of orange blossom and is supposed to remove even waterproof mascara without dehydrating the skin. There is enough for about three or four uses. It will definitely not be enough for my time in London, so I will nip it into my weekend travel bag. I doubt I will repurchase - I plan to buy the Eve Lom cleanser anyway and the Omorovicza version costs £46 a jar. I have been trying to get the hang of falsies and have proceeded to trash two pairs already. I'm glad there is another pair I can play with. My own lashes are so sparse, I look like Grima Wormtongue even with mascara. This serum claims to specifically target fine lines. There is just 3ml of it, which means it will be used up in two or three nights. I am all for trying out new skincare, but surely there must be at least 10ml of product to try out before you decide whether to repurchase or not? Nuxe dry oil is my favourite oil ever! It is multipurpose, smells of cake mix and is the only oil that does not give me a sprained neck even if I leave it on my hair overnight. This is the golden, shimmery version. It should be good on the legs, giving them a nice summery glow. They can send me as many of these as they like - I have repurchased the dry oil several times already. I use fake tan on my legs with positive results. Tanworx is from Monu, one of the most effective skincare brands out there. I love how this lotion smells and looks on me. I suppose we will see a number of fake tan and bronzing products in beauty boxes until August, by which time I'm sure we'll have enough for a few years. A much better effort from LookFantastic this month after the recent onslaught of pills, mouthwash and health drinks. I love that they included Nuxe, and the hair mask and the cleansing balm look great - I can't wait to get started on those. With an annual subscription, the box comes up to just £9, which is a very good deal, since the brands they included are spendy. To subscribe, go here. In addition to beauty boxes, LookFantastic is a great place to shop and they have excellent GWPs most months. This month, LookFantastic also included a spoiler for the June box - there will be a REN product! I will have to get my box shipped to my address in London, so I will be showing you what I get when I get a moment to blog. Stay tuned!